Poison Ivy at the World Cup Asia 2010! Many thanks to World Cup Asia 2010’s Official English Daily, the Malay Mail, for our ad campaign! There will be a total of 5 full-page advertisements, 3 of which are already out (see below for the first two). The next ad will be out on the Thursday 25th of November, so be sure to grab your copy! The Final World Cup Asia 2010 Official Poster is up! We’re extremely excited to release the final version of the World Cup Asia 2010 Official Poster! Air Asia – Asia’s Leading Airline – is back with the World Cup Asia 2010! Bonus prizes for the tournament now includes air tickets! Don’t miss your chance to be a part of what will be the greatest Asian paintball tournament ever. Major kudos to everyone who made this possible! Paintball Clinic with Russian Legion’s Justin Rabackoff – Exclusively at World Cup Asia 2010! Want to learn how to play like a pro? Then join the paintball clinic by US pro player Justin Rabackoff, from renowned team Russian Legion, champions of the PSP Mid-Atlantic Open (US), and winners of the Millennium Series in Europe. 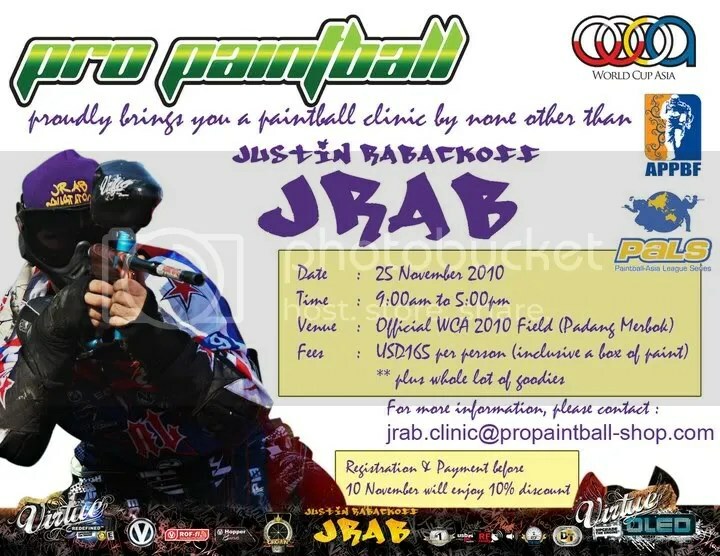 Ranked the #1 Player of the Year for 2009 by Splat Magazine, the 22-year-old pro, also known as JRab, will be down for an exclusive paintball clinic only at the World Cup Asia 2010, brought to you by Pro Paintball. Entry fee to the clinic is USD$165 (RM550), inclusive of one box of paint, and other goodies.